As we know, anyone can watch videos on YouTube website. And YouTube also enables users to download or save their favorite videos or movies on their own computers, so that they can view them without being connected to the Internet. Then, how to cut videos from YouTube? In order to answer this question asked by Sam Castle at Quora, we will show you two simple methods to cut YouTube videos with ease. One of the easiest ways to split YouTube videos is to cut and convert them by using some online video trimmers such as YouTube Cutter. No need of YouTube Cutter download, you can just do it on the Internet. Here is how. Enter keywords or YouTube URL and then click the "Search" button to find out the video you want to trim. Once you find your target video, operate with the slider to choose which part you're going to preserve. 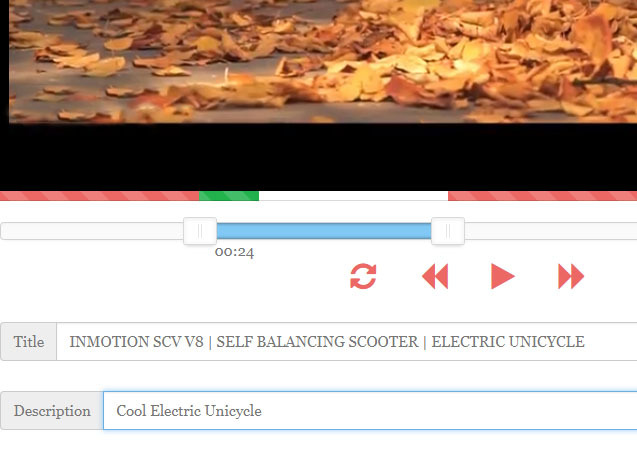 With the red controls, you can also preview the new video on the top. When you're done, you can set the quality of the video, such as auto, 144p, 240p, 360p and 480p. Choose one in accordance with your needs. Make a new title and description for your video. 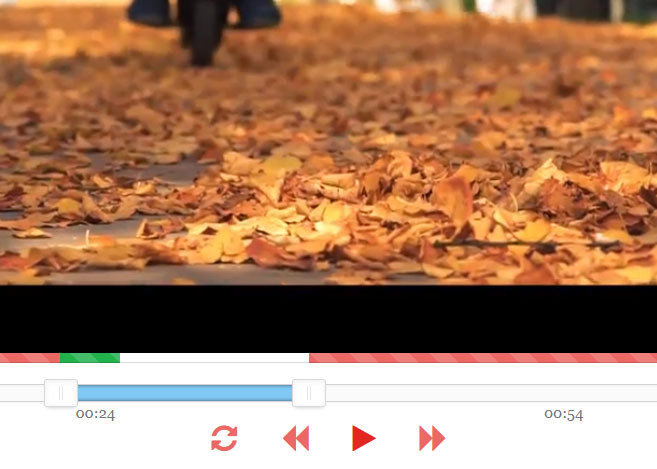 Now, click the red "Cut" button and start to trim this video with YouTube cutter online. Wait for a few minutes to get the video you desire. Alternatively, you can download it or upload on YouTube to share it with your friends. If you're not happy with YouTube Cutter when trimming videos with it, you can also take a look at some other similar free online tools to cut YouTube videos, and here we just list a few of them. 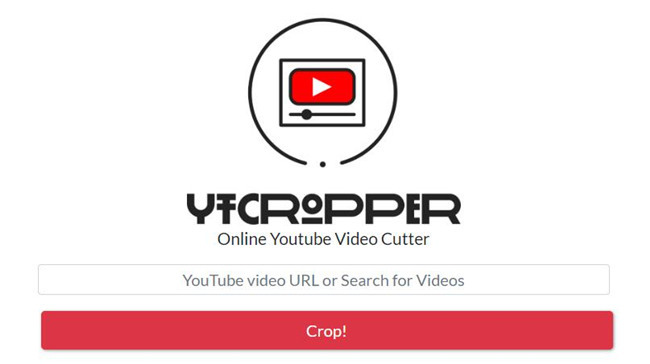 YTCropper is smart tool to help users cut YouTube video and create a custom length and then share it with your friends and families via Twitter, Facebook, email or text messages and more. 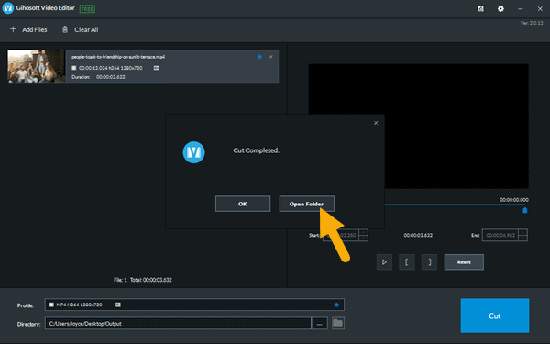 Cutting YouTube videos with YTcropper is also very easy. You only need to open the official site, paste YouTube URL, set start time and stop time of the video, and click the "Crop" button to start to cut YouTube video immediately. That's it. HeseTube.com is another popular YouTube cutter and downloader that enables users to chop the video with ease. After pasting your target video URL from YouTube, you can simply enter the start time and end time by previewing the video clip. Then just click the "Download" button and it will cut the video clip you want. The third online YouTube cutter introduced here is Online Video Cutter, which is a free site to crop any video in the format of MP4, MPG, AVI, 3GP, etc. You can not only use this tool to crop the videos, but also edit the video clip such as rotate a video. The cutting process is also very simple and needs a few steps. Anyone can take it to do the video trimming, even if he/she has never used it before. The only disadvantage is that you need to enable the installation of Adobe Flash Player in your browser. See also: Cut Videos Online? So Easy! Are you feeling tired of viewing some nasty ads on the Internet when you open a web page? Maybe this is one of main disadvantages of YouTube Cutter. Every time when you click one button to move forward the cutting process, it will pop up an ad. It will make you feel confused whether your computer has been attacked by the virus. Therefore, many users may quit using such online video processing tools like YouTube cutter and converter, and turn to offline video cutter software. 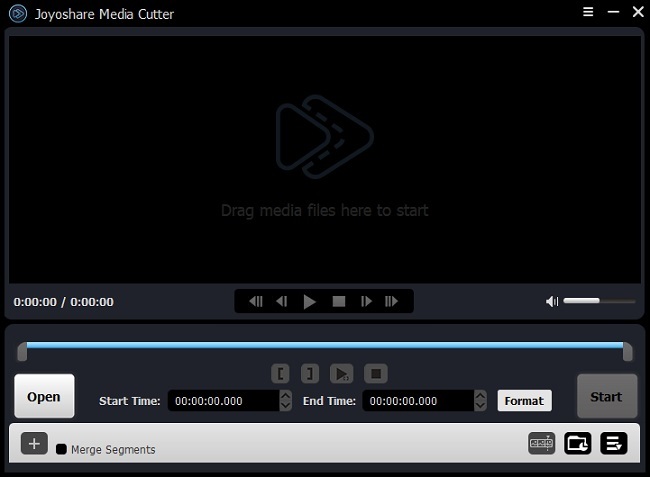 Joyoshare Media Cutter is one of easy-to-use yet powerful video trimmer you need to know. 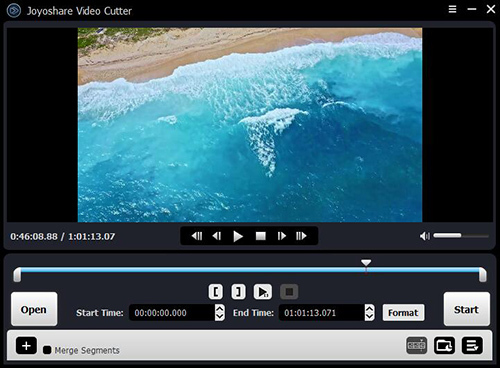 With clean and simple user interface, Joyoshare video cutter provides an easy way for users to cut and converter any videos, including YouTube videos. You can get a new video with almost 100% original quality at a fast speed. Besides, the video cutting tool supports tons of popular video file formats, such as MP4, H.264, M4V, AVI, MPG, MPEG, MKV, WMV, 3GP, 3G2, ASF, VRO, OGV, PMVB, and etc. In addition, you can also get the new video played on various devices, including Android, iPhone, Windows Phone, smart TVs, game consoles and so on. Now, let's see how to crop YouTube videos with Joyoshare Media Cutter. But before that, please remember to download the video from YouTube and save it on your computer. Here we will take Windows version as an example. Make sure you have downloaded and installed Joyoshare Media Cutter first. 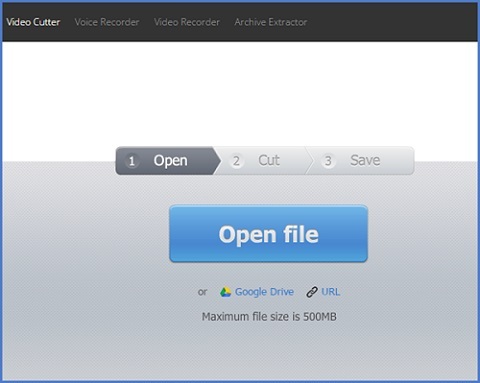 Launch the software, and import the Youtube video to the trimmer by clicking the "Open" button. Or, just drag and drop the target video to the program. You have two ways to do it. One is just move the yellow slider to any position you want. The other is to manually set the start time and end time. If you want to split the video into several parts, click the "+" button to start a new task. Then, click the "Format" button to select any output format as you like. You can also customize file quality, format and codec. We recommend you to choose the high-speed mode, because this is fast and lossless. Now, it's time to trim the YouTube video. Just click the "Start" button and wait for a while until it's done. If you want to join the segments you have cut, just tick the "Merge Segments" box, and they will be merged together. The trial version of Joyoshare Media Cutter only offers five opportunities for users to cut YouTube videos without any quality loss. You have to buy the full version to unlock the limiation. 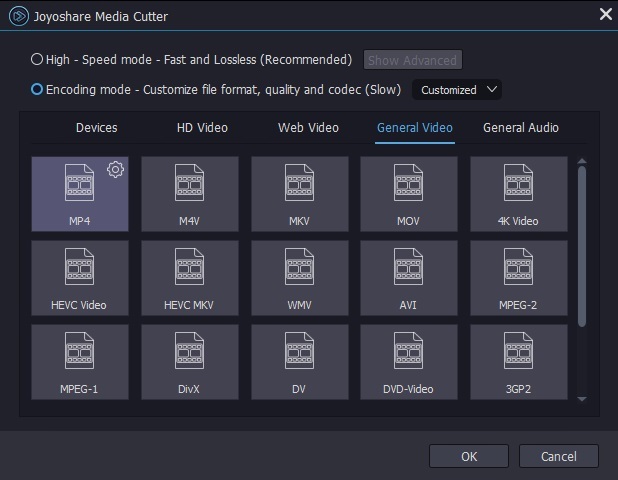 If you have not enough budget, you can refer to the following similar free desktop tools, but if you care more about output quality, you can take Joyoshare Media Cutter as the first consideration. This is a free and easy-to-use YouTube video cutter that allows users to trim a large YouTube video into smaller ones and remove the unwanted fragments. 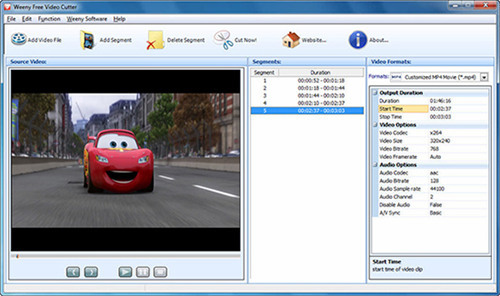 It supports a wide range of video formats including DVD, MP4, VOB, MKV, WMV, MPEG, and many more. 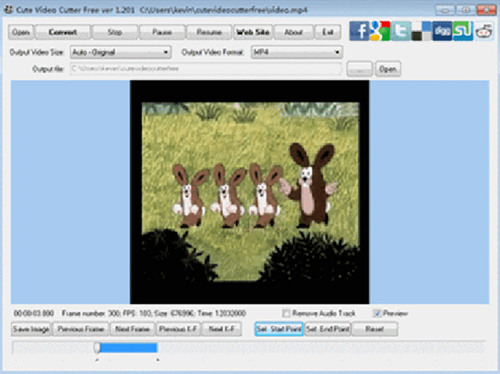 Weeny Free Video Cutter is also another video cutting freeware that can be used to cut large YouTube video files, adjust the output settings like change the video codecs, frame rates, bit rates, etc. It can save as many other media formats such as MP4, WMV, 3GP, FLV, MPG and so on. Gihosoft Free Video Cutter is a free YouTube video cutter to cut any movie from YouTube without quality damage. You can use it to cut a large YouTube video in 3 simple steps: import a target video file, accurately set a time range for cutting and export it as a new video in various formats including MP4, AVI, MPG, MPEG, VOB, WMV, 3GP, FLV, MKV, DVD, etc.